Daikin Heat Recovery Condensing Units, Daikin Fancoil Units, Addison Packaged MakeUp Air Units with Heat Recovery, DaikinMcquay Split MakeUp Air System with Heat Recovery, Daikin I-Touch controller for complete building control. 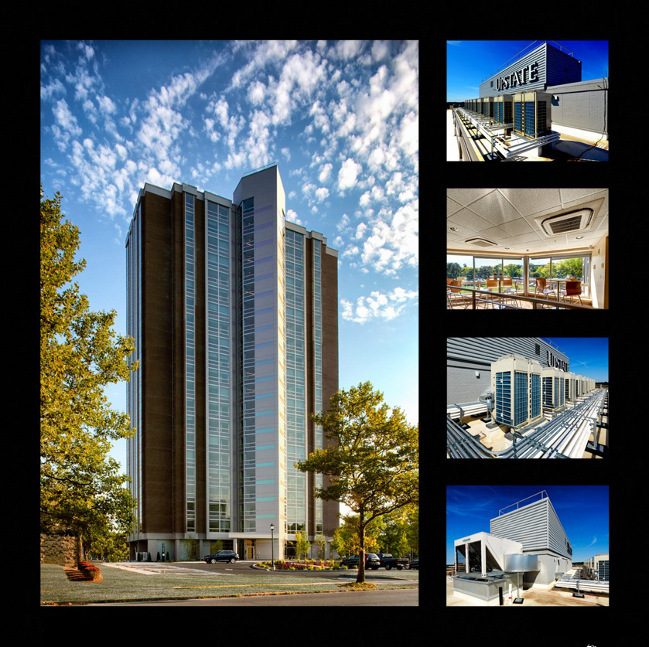 This complete retrofit of a high-rise for student housing presented logistical and budgetary challenges for the developer and engineer. Ultimately, the Daikin VRV system offered the performance that was required within the space limitations of the existing floor plan in a building that previously utilized only radiant heat for conditioning. The extensive piping range for the Daikin system allowed for mounting the 210 tons of heat recovery condensing units on the roof 21 stories above downtown Syracuse. The VRV option was critical in getting the project into budget, costs were 50-70% lower than conventional 4 pipe systems proposed for the retrofit. Copyright 2019. Modular Comfort Systems. All Right Reserved.